With the Big One 20 years behind us, Los Angeles has been lulled into a sense of safety. Jokes about us falling off the map and floating into the ocean appear to have withered on the vine—maybe that’s because it’s more likely that we’ll slide northward over Oregon, or maybe, like my parents say, there’s just no escaping earthquakes these days. They’ve hit everywhere from Georgia to Wisconsin. But not every state has earthquake culture. Many Angelenos follow @earthquakeLA on Twitter. More and more people are participating in the annual October Great ShakeOut. And then there’s the chatter about earthquake kits, which every last one of you should have! Of course, if you’re anything like me, you have yet to actually make (buy?) 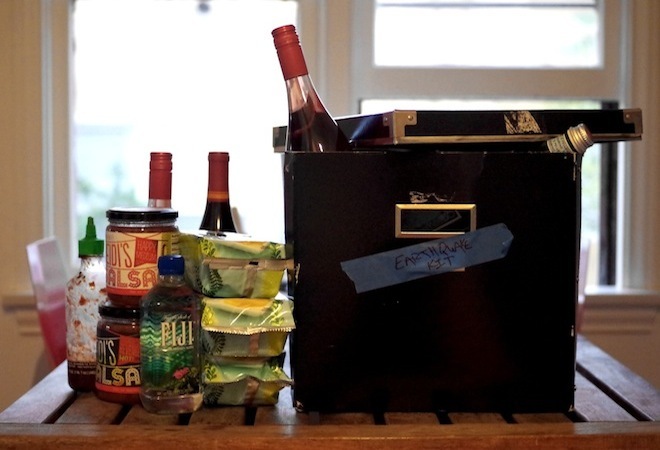 an earthquake kit, you’re not sure what, beyond water, needs to go in them, and you are resigned to living with a mild amount of fear and that nagging sense that you forgot to do something today. Why do we live like this? Why don’t we all go out tomorrow, take out some cash, and buy a ton of canned goods, flashlights, fire extinguishers, candles, keys (I don’t know, I’m guessing). It’s (probably) not that difficult! Most of the things we need are (I think) right here in our homes and apartments.